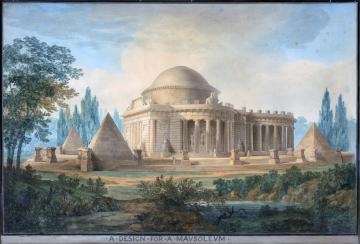 Soane designed this mausoleum for William Pitt, 1st Earl of Chatham (1708 –1778), on hearing of his death whilst in Rome on his Grand Tour in May 1778. Pitt was a Whig statesman who had led the British Government twice in the middle of the 18th century. He is usually now referred to as William Pitt the Elder to distinguish him from his son, William Pitt the Younger, for whom Soane worked on a number of projects. 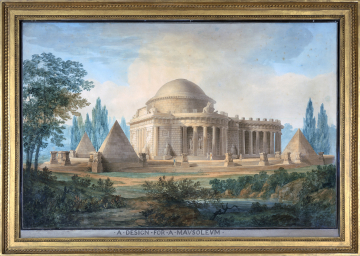 Connections made through Soane's friendship with Thomas Pitt (a cousin of Pitt the Younger) whom he met in Rome, proved seminal for his later career. Exhib: ? RA 1799, no.942.